All of our events are open to the public! No matter who you are, you are welcome and we'd love to see you there. 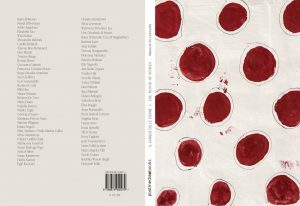 Manuela De Leonardis discusses The Blood of Women. Traces of Red on White Cloth, a traveling exhibition and book (supported by the Pasquale Battista Foundation) which brings together the work of 68 international artists. The exhibition explores transnational feminisms presenting work about the taboo of menstruation. 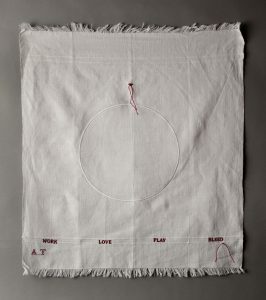 Antique menstrual cloths are used as the basis for the work of each artist providing new clues for reflection about different aspects of the feminine including birth, puberty, motherhood, sexuality, menopause, and violence. Personal narratives, memories, and stories— some private, some ordinary, some extraordinary—are brought forward in this work. Manuela De Leonardis (Rome 1966), Art Historian, Photo Archivist, Journalist and Independent Curator has been writing about visual arts since 2004 for the Italian newspaper “il manifesto”. The project The blood of women was presented in 2015 at the International Women’s Home in Rome; in 2016 at the Teatro Stabile Comunale of Isola del Liri (Frosinone); in 2017 at the Center for Contemporary Art La Rocca Umbertide (Perugia), at the Galerija Forum in Zagreb and Galeria Rigo in Novigrad-Cittanova (Croatia) and at the Monastery of S. Benedetto di Conversano (Bari) as part of the project La Città delle Donne curated by Rocco De Benedictis; in 2018 at Palazzo Fibbioni L’Aquila and at the Department of Radiotherapy Oncology – Clinical Hospital SS. Annunziata of Chieti. The blood of women. Traces of red on white cloth will be available from January 2019. This lecture is organized by Susan Harbage Page, Associate Professor, UNC Department of Women’s and Gender Studies.